Nigel Westlake is renowned for his gentle piano work, uplifting string sections, and his vivid clarinet playing. The artist clearly ascribes this both to his father's instruction and his love affair with music ever since he was a child. In his mid-teens, during the all-important mid-seventies (crucial years for film scores in general), Westlake started playing clarinet alongside members of fusion music bands, playing anything from rock to jazz, and then gradually moved into the orchestral arena. At first he would attend soundtrack recording sessions, scaling his way up to soloist clarinettist with prevailing Australian orchestras and classical ensembles. At this point, he also started touring with these orchestras, from the ultramodern neon-lit Tokyo and Beijing, to the romantic old-worldly cities of Paris and London, and many many more. Needless to say that Westlake was pretty much established at this point. In the late eighties, Westlake teamed up with Phil Colson and Michael Askill to compose the music for Candy Regentag, a sombre drama from director James Ricketson. In 1991, Nigel Westlake composed the contemplative music for the John Weiley documentary Antarctica. The film won the "Jury Prize for best IMAX documentary" the same year. Backsliding was to be the composer's next score the following year, a small-budget film that contained some interesting emotive elements that could flourish with music. However in 1995, Westlake was asked to score the box-office family-film Babe. This was the composer's opportunity to stand out, resulting in a colourful and uplifting soundtrack, as well as a keen friendship between Westlake and the film's director Chris Noonan. With Babe, Westlake made full use of the orchestra's powerful wind instruments and string sections, almost celebratory in it's euphoria - normally this would result in an overpowering and pretentious score, but not with Westlake. Babe won the "APRA Music Award for Best Film Score" in 1996. Babe: Pig in the City (Babe 2 - directed by George Miller) soon followed in 1998. Very few sequels actually live up to the original, and "Pig in the City" was no exception. The music did not quite manage to outdo the spontaneous quality of its 1995 counterpart, but still embraced its much-admired style. Recently, the composer has scored Chris Noonan's Miss Potter, updating his Babe-style compositions into something quite unique. Mature, bold, subtle, imaginative, graceful, dreamlike are all words that could describe this music. Westlake is proving that he can escape the realms of repetition and tradition whilst scoring a huge box-office family-film, and yet impose the right amount of restraint on this art in effort to perfectly settle into the minds of the viewer. This also proves that the Noonan-Westlake collaborations are the perfect artistic chemistry, much like the Spielberg-Williams entries in cinema. Nigel Westlake provides a summary of his musical background and talks in depth about the Miss Potter soundtrack, in This Interview conducted shortly before the release of the film in the UK. 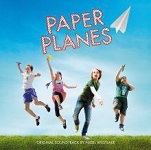 After a gap of a few years, Westlake has returned to film-scoring and Paper Planes is currently doing the film festival circuit with a heartwarming score by Westlake beautifully recorded with the Melbourne Symphony Orchestra. If you're a film music fan you will no doubt spot a little homage to music from "The Battle of Britain" (both the Ron Goodwin and William Walton sections), but this is just a momentary and fitting tribute, and it is Westlake's own heartfelt voice which fills the soundtrack. Nigel Westlake's official website is at www.rimshot.com.au. The main theme from "Babe" is taken from the 3rd Symphony of Camille Saint-Saens and here on mfiles we have an excerpt illustrating The Babe Theme in its original full orchestral version or arranged for piano. The sequel soundtrack is subtitled "from and inspired by" so it is not only Westlake's mustic that you will hear. Check out our review of the recent Miss Potter for more information about this soundtrack, or look to the "Antartica" soundtrack (which can be difficult to find) or the "Onomatopoeia" album for other examples of Nigel Westlake's music. Paper Planes is not yet available on Amazon, but it can be downloaded from iTunes or streamed on Spotify - check out our review for details.